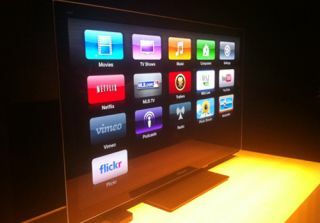 Apple iTV to be an OLED TV? | What Hi-Fi? Apple iTV to be an OLED TV? Apple has hired a former senior researcher from LG Display with experience working on OLED TV, adding another twist to the much-rumoured Apple iTV. It was, unsurprisingly, confirmed that Apple was looking at the idea of a TV at the back end of last year, and the latest news suggests it might just be an OLED. Apple has hired the services of Dr. Lee Jeung-jil, formerly at LG Display and also involved with the P-OLED research at Cambridge Display Technology. Apple was also recently granted a whole host of patents, which included one centred around manipulating a touchscreen OLED device. Specifically Apple has invented "a method of patterning thin film glass on a glass substrate with an uneven surface", reports Patently Apple. Previous speculation has suggested an Apple iTV would come packing Apple’s Siri technology, which would allow users to control the majority of functions simply by giving it commands.